The armed school resource deputy at Marjory Stoneman Douglas High School in Parkland, Florida, waited outside the school building as the shooting unfolded last week, officials said. Scot Peterson never went in after taking a position on the west side of the building, Broward County Sheriff Scott Israel said at a Thursday afternoon news conference. Peterson resigned after he was suspended without pay by Israel pending an internal investigation into his actions during the shooting that left 17 people dead, Israel said. Peterson was eligible for retirement. Israel told reporters Peterson should have "[w]ent in. Addressed the killer. Killed the killer." Instead, the deputy waited outside for about four minutes. During that time, Israel said, Peterson got on his radio and took a position where he could see the western entry of the building. Asked how he felt watching the footage, Israel said: "Devastated. Sick to my stomach. There are no words. These families lost their children. We lost coaches. I've been to the funerals, I've been to the homes. ... I've been to the vigils. It's just -- there are no words." CNN was attempting to reach Peterson for comment. Peterson held several jobs, including working as a security guard and stock clerk, before he was hired as a sheriff's deputy in 1985, according to his personnel records. He also served in the military, he told the sheriff's office. Peterson, who attended Florida International University, was largely lauded for his performance on the job, including garnering two deputy of the year nominations in recent years, the personnel records show. In 2015, Israel noted Peterson's then-30-year tenure. "Your dedication and allegiance are the best illustrations of the service [the sheriff's office] provides to the people of Broward County," Israel wrote, according to the records. Israel said two other deputies have been placed on restricted duty while the sheriff's office investigates their actions during calls to the gunman's home before the shooting. Since 2008, he said, the sheriff's office was involved in 23 calls involving either Nikolas Cruz or his brother. During some of the calls -- which were handled both in person and on the phone -- deputies met with Cruz's mother. The sheriff's office identified the deputies as Edward Eason and Guntis Treijs. CNN has reached out to the deputies. Jeff Bell, president of Broward County Sheriff's Deputies association, said he doesn't foresee any major problems with the officers' handling of the calls. The sheriff's office released details on the 23 calls. Two calls involving the deputies are under investigation. "Third hand information received from neighbor's son that Nikolas Cruz planned to shoot up the school on Instagram [Picture of juvenile w/guns] one month time delay. Unknown high school. Cruz lives in the area." "Deputy responded. Made contact with caller who wished to remain anonymous. Determined Nikolas Cruz possessed knives and a BB gun. Information forwarded to Stoneman Douglas school Resource Officer." "Caller advised subject Nikolas Cruz is collecting guns and knives. Cruz wants to join the Army. Concerned he will kill himself one day and believes he could be a school shooter in the making. Caller advised Cruz was no longer living at the listed Parkland address and is now living in Lake Worth, FL. Believes the weapons are kept at a friend's house at an unknown location." "Deputy contact caller (located in Massachusetts) via telephone. No report was initiated. Post MSD incident interview: Deputy advised he referred caller to the Palm Beach Sheriff's Office." After speaking with the internal affairs department, Israel decided to put the deputies on restricted duty while his office investigates "whether or not they could have done more, or should have done more," he said. Officials also reported Thursday that surveillance footage from the school shooting was not shown live, as responding officers initially thought. According to Coral Springs Police Chief Tony Pustizzi, the footage had been rewound, and police were watching it on a 20-minute delay, leading them to believe the gunman, Nikolas Cruz, was still in the building when he was long gone. "The delay never put us in a situation where any kids' lives were in danger, any teachers lives were in danger," Pustizzi said at a news conference Thursday afternoon. But last Wednesday the footage was rewound, Pustizzi told reporters. At some point, there was a miscommunication and officers believed they were watching real-time footage. The rewound footage did not put any lives in danger, Pustizzi said, but it "did cause some confusion" when officers entered the school. "At first the the guys are hearing, 'Oh he's on the second floor,'" Pustizzi said in the news conference. "Well it's not true. Because we have people on the second floor, and the people are saying, 'No, he's not on the second floor.'" The Broward County School district said in a statement that its security system footage could be reviewed in both real-time or be rewound to see events that were previously recorded. "During the immediate response to the event, the system was being viewed in real-time and the recorded footage was being viewed to retrace the actions of the shooter," the statement said, adding that the district no longer had access to the footage or the server it was stored on because investigating authorities have it. "Somebody would say, 'He's on the second floor,' and we had guys on the second floor saying, 'We're on the second floor, we don't see him.' That's when we figured out there's a tape delay," Pustizzi told the Sun Sentinel. According to police scanner traffic from the streaming website Broadcastify, at 2:43 p.m. on February 14, police found someone to give them access to the school's security footage. "I got a guy here outside the building that can get cameras," says one voice. "We're going to go inside and go get to the cameras." By 2:54 p.m., police were watching the gunman make his way through the building, according to the dispatch audio. But the suspect had fled the building 26 minutes earlier at 2:28 p.m., according to a preliminary timeline provided by the Broward County Sheriff's Office. By 2:50 p.m., the suspect had already bought a drink at a Subway restaurant inside a Walmart store and left on foot, four minutes before scanner traffic said the gunman was still on the second floor of the school. 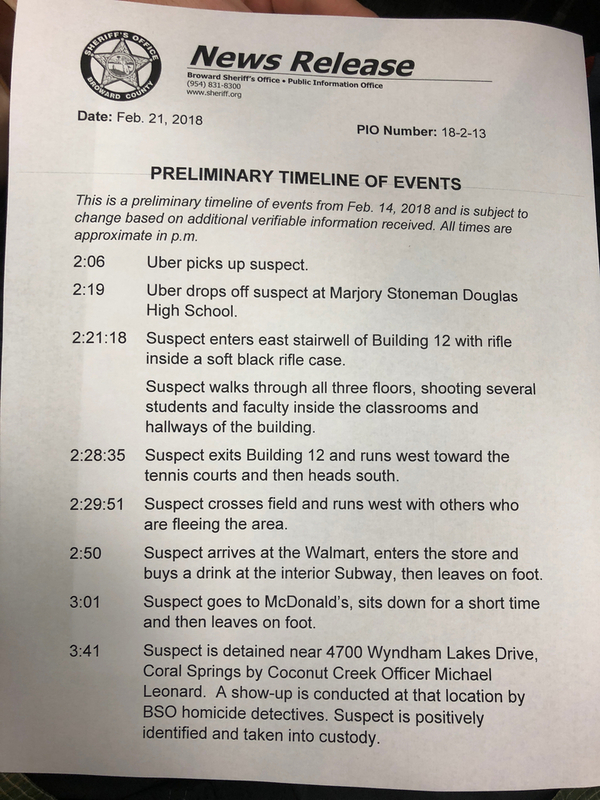 At 3:02 p.m., when the Broward County timeline says Cruz briefly stopped at a nearby McDonald's, an officer says the suspect dropped a bag near a stairwell. Another officer asks if the footage is a recording. "Yes, sir. It's about a 20-minute delay," the first officer says. "They're following him on video on the camera. They had him exiting the building, running south." At 3:41 p.m., Cruz was identified and taken into custody. UPDATE: This story has been updated to reflect new information from the Coral Springs Police Department.